In part because that sales pitch could just as easily have come from a commercial baby milk pamphlet. When our phrasing and that of the baby milk industry are interchangeable, one of us is going about it wrong...and it probably isn't the multinationals. Here is some of the language that I think subverts our good intentions every time we use it. When we (and the artificial milk manufacturers) say that breastfeeding is the best possible way to feed babies because it provides their ideal food, perfectly balanced for optimal infant nutrition, the logical response is, "So what?" Our own experience tells us that optimal is not necessary. Normal is fine, and implied in this language is the absolute normalcy - and thus safety and adequacy - of artificial feeding. 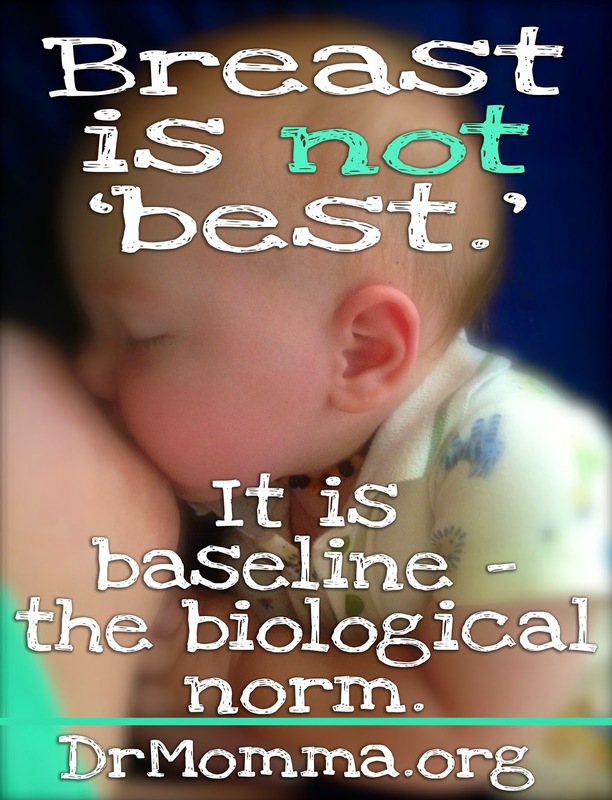 The truth is, breastfeeding is nothing more than normal. Artificial feeding, which is neither the same, nor superior, is therefore deficient, incomplete, and inferior. Those are difficult words, but they have an appropriate place in our vocabulary. Advantages. When we talk about the advantages of breastfeeding - the "lower rates" of cancer, the "reduced risk" of allergies, the "enhanced" bonding, the "stronger" immune system - we reinforce bottlefeeding yet again as the accepted, acceptable norm. Nowhere is the comfortable illusion of bottlefed normalcy more carefully preserved than in discussions of cognitive development. When I ask groups of health professionals if they are familiar with the study on parental smoking and IQ (1), someone always tells me that the children of smoking mothers had "lower IQs." When I ask about the study of premature infants fed either human milk or artificial milk (2), someone always knows that the breastmilk-fed babies were "smarter." I have never seen either study presented any other way by the media - or even by the authors themselves. Even health professionals are shocked when I rephrase the results using breastfeeding as the norm: the artificially-fed children, like children of smokers, had lower IQs. Inverting reality becomes even more misleading when we use percentages, because the numbers change depending on what we choose as our standard. If B is 3/4 of A, then a is 4/3 of B. Choose A as the standard, and B is 25% less. Choose B as the standard, and A is 33 1/3% more. Thus, if an item costing 100 units is put on sale for "25% less," the price becomes 75. When the sale is over, and the item is marked back up, it must be marked up 33 1/3% to get the price up to 100. Those same figures appear in a recent study (3), which found a "25% decrease" in breast cancer rates among women who were breastfed as infants. Restated using breastfed health as the norm, there was a 33-1/3% increase in breast cancer rates among women who were artificially fed. Imagine the different impact those two statements would have on the public. Special. "Breastfeeding is a special relationship." "Set up a special nursing corner." In or family, special meals take extra time. Special occasions mean extra work. Special is nice, but it is complicated, it is not an ongoing part of life, and it is not something we want to do very often. For most women, nursing must fit easily into a busy life - and, of course, it does. "Special" is weaning advice, not breastfeeding advice. 4) artificial milk feeds (4). We need to keep this clear in our own minds and make it clear to others. "The next best thing to mother herself" comes from a breast, not from a can. The free sample perched so enticingly on the shelf at the doctor's office is only the fourth best solution to breastfeeding problems. The males I asked responded, "No. Knowing about aerodynamics doesn't mean you can fly an airplane." "No, because I would have done my best." "No. I might feel really bad about the plane and pilot, but I wouldn't feel guilty." "No. Planes are complicated to fly, even if you've seen someone do it." What did the females say? "I wouldn't feel guilty about the plane, but I might about the pilot because there was a slight chance that I could have managed to land that plane." "Yes, because I'm very hard on myself about my mistakes. Feeling bad and feeling guilty are all mixed up for me." "Yes, I mean, of course. I know I shouldn't, but I probably would." "Did I kill someone else? If I didn't kill anyone else, then I don't feel guilty." Note the phrases "my mistakes," "I know I shouldn't," and "Did I kill anyone?" for an event over which these women would have had no control! Pros and cons, advantages and disadvantages. Breastfeeding is a straight-forward health issue, not one of two equivalent choices. "One disadvantage of not smoking is that you are more likely to find secondhand smoke annoying. One advantage of smoking is that it can contribute to weight loss." The real issue is differential morbidity and mortality. The rest - whether we are talking about tobacco or commercial baby formulas - is just smoke. One maternity center uses a "balanced" approach on an "infant feeding preference card" (5) that lists odorless stools and a return of the uterus to its normal size on the five lines of breastfeeding advantages. (Does this mean the bottlefeeding mother's uterus never returns to normal?) Leaking breasts and an inability to see how much the baby is getting are included on the four lines of disadvantages. A formula-feeding advantage is that some mothers find it "less inhibiting and embarrassing." The maternity facility reported good acceptance by the pediatric medical staff and no marked change in the rates of breastfeeding or bottlefeeding. That is not surprising. The information is not substantially different from the "balanced" lists that the artificial baby food salesmen have peddled for years. It is probably an even better sales pitch because it now carries very clear hospital endorsement. "Fully informed," the mother now feels confident making a life-long health decision based on relative diaper smells and the amount of skin that shows during feedings. Women may say they "breastfed" for three months, but they usually say they "nursed" for three years. Easy, long-term breastfeeding involves forgetting about the "breast" and the "feeding" (and the duration, and the interval, and the transmission of the right nutrients in the right amounts, and the difference between nutritive and non-nutritive suckling needs, all of which form the focus of artificial milk pamphlets) and focusing instead on the relationship. Let's all tell mothers that we hope they won't "breastfeed" - that the real joys and satisfactions of the experience begin when they stop "breastfeeding" and start mothering at the breast. If you found this article of interest, you may desire to ensure you regularly receive your own copy of the Journal of Human Lactation (JHL). Taking out membership in the International Lactation Consultant Association (ILCA) includes the benefit of four issues of the JHL a year. See their home page for how to join. More from Diane Wiessinger at Common Sense Breastfeeding. For further information on breastfeeding, see resources (books/articles/websites) on this page. 1. Olds D. L., Henderson, C. R. Tatelbaum, R.: Intellectual impairment in children of women who smoke cigarettes during pregnancy. Pediatrics 1994; 93:221-27. 2. Lucas, A., Morley, R., Cole, T.J., Lister, G., Leeson-Payne, C.: Breast milk and subsequent intelligence quotient in children born preterm. Lancet 1992; 339 (8788): 261-64. 3. Fruedenheim, J.L., Graham, S., Laughlin, R., Vena, J.E., Bandera, E., et al: Exposure to breastmilk in infancy and the risk of breast cancer. Epidemiology 1994, 5:324-30. 4. UNICEF, WHO, UNESCO: Facts for Life: A Communication Challenge. New York: UNICEF 1989; p. 20. 5. Bowles, B.B., Leache, J., Starr, S., Foster, M.: Infant feeding preferences card. J Hum Lact 1993; 9: 256-58. 6. Klass, P.: Decent exposure. Parenting (May) 1994; 98-104. I loved this. LOVED IT. I was just thinking the other day about how you don't see "The benefits of not smoking while pregnant" panflits. It is alot about our language, langauge does shape the way we think. Thankyou, I will share this far and wide. I've shared this with many of my BF mama friends and many of them have admitted to having feelings of inadequacy and failure when their breastfeeding infants had normal occurrences of gas or reflux (as if something was "wrong" with their milk), or when their baby was deemed to weigh too little at the doctor's office (as if their milk was not supplying enough nutrition), or even feeling inadequate for not having the ability to find a quiet place an relax while nursing. Personally, I refer to formula as substandard infant food. Babies deserve better! If everyone who could breastfeed would, then we'd have plenty of extra human milk available for the mom's who can't breastfeed. Great article! It really does put an interesting spin on how terminology can twist reality to make people feel better about their choices. Aside for those For whom bf just doesn't work, it really is a sad commentary on society that so many mothers give up this beautiful bonding experience because it doesn't "fit" their modern lifestyle. I'd like to see women have minimum one year maternity leave so we all have the opportunity to do what is best for our babies. It's a little long so I couldn't read it all, but I LOVE this article. I have never thought of breastfeeding using the "normal" language and I didn't realize how I was thinking of it until now. My first was in the NICU and it took me 3 months of pumpinguntil he miraculously latched one day. I know it can be hard but I wanted my children to have what God intended, not the 4th best. Thank you for posting this so fairly. My daughter was born with a cleft palate and I pumped for three months before I had to start giving her formula. But no one had told me I could have feed her breast milk longer if I had used a certain supplemental system and being a teenaged mother, I had no idea. But I hate it that so many people who are pro-breast feeding, or whatever you like to call them, look down their noses at me and tell me I should have "tried hard" or "done more research" or used a milk bank (which by the way, costs a fortune and I think is extremely unfair since all the milk they collect comes in by donation, but thats another story). Maybe that is true, but where were you when I was struggling with pumping all day and all night and trying so hard to get those first three months worth of breast milk to my daughter? Oh, anyway, I really appreciate that this was not a "bottle bashing" article but it was fair. Thanks so much for that. I've breastfed 3 kids now (ok, currently feeding the third). I was utterly uneducated when I had the first one, and breastfed her because it just seemed like what you should do. No guilt, no worry, no assumption of doing 'the best thing', no fear of failure. So of course I've just done the same thing with the next two. I'm lazy, breastfeeding is good for lazy people. Baby cries? Have a boobie! Too easy. The annoying thing is the local nurses seem to think it is unusual that I have a happy baby putting on the median amount of weight, with just breastmilk! "Baby cries, have a boobie." lol! I couldn't agree more about mothering at the breast. Though the point of this post wasn't religious, I think it's important for those of us who do follow a Judeo-Christian religion to note that the Bible speaks many times of God nurturing His people at His breast. So if you believe in God, you pretty much have to view parenting as something that is done at the breast, not in a bucket or bouncy swing. I don't think many modern religions do a good job of pointing that out. Anyway, I am sharing this post as well. Brava!! Let's start telling Mothers about pharmaceutical options for increasing milk supply. I have PCOS & never had enough milk to breast feed exclusively. Only 2 years after the fact did anyone (lactation consultant, Dr, friend etc) tell me there is medication that can increase milk supply. I took every single stinkin suggestion, you name the tea, the supplement, the pumping after feedings, I did it - for 9 months. Not once did any of these well meaning sources ever say anything about medication. I believe in & agree with holistic health but right now after reading this I don't feel angry about some Dr telling me to give my baby a bottle (which they never did) I feel angry towards the devout holists that left out information that could have made it so I could have breast fed my baby for longer. It's frustrating to feel like the only person that believes in integrated healthcare: western, eastern, & holistic combined & used to make informed decisions to maximize the quality of ones health & life. and seem to be commonplace among most lactation consultants and groups. As with all drugs, there are side effects (sometimes bad, for some mothers) and a woman should be fully informed on all aspects of her options so she can make the best decision for herself and her baby. Frequently, the reason for low milk supply is that hormones have been so powerfully impacted (via artificial hormones taken, drugs at/surrounding birth, birth trauma, not being skin-to-skin with baby in the early weeks/months, lack of baby wearing, lack of cosleeping, and mom working apart from her baby for many hours each day are just several of the ways that milk-producing hormones are influenced). It is very difficult, even with pharmaceutical options, to reverse the effect of this hormonal activity. If the foundation is not laid for a healthy breastfeeding relationship, it is tough to build on top or 'fix' what is broken at the very core. It again comes back to being well informed - how lactation works, how milk supply is impacted, and the many options available when the system breaks down. Our current culture fails mothers when we do not offer them ALL information pertinent to breastfeeding - pharma options included - before their babies are born (when milk supply begins its manufacture). I've been in both worlds. Breastfed my daughter for 2 years. Had brain surgery when she was almost 3. Pituitary gland (and therefore prolactin gland removed. Recovered from cushings disease. Got pregnant with help of hormones. Give my daughter formula for most feeds from birth. It's hard bottlefeeding, my bub does cry more than her big sister did, has more wind and nappies too, but is healthy and happy and mine. Hi,I breastfed my children.With my first it could have gone either way and I was lucky. I was a LLL for ten years. I was inspired to start listening to the stories of women when breastfeeding hasn't worked out. I would encourage you to do this too it gives us the most accurate info on what is needed.What I now know is that for many women bottle feeding is not a choice, it is the end to a sense of prolonged crisis. IMO learning to deal with this crisis and provide a safe place for women to talk about difficulties would be a great step forward. Acknowledging women's grief when breastfeeding doesn't work out is also important.If women were better supported when breastfeeding didn't work out this would be a great service for breastfeeding.For more info see a face book page I have created- supportive community when breastfeeding doesn't work out. Amazing post!!! Thoroughly enjoyed it. Thank you so very much for this insight!! Carrie! I had the same thing in the hospital! If I could do it all over again, I would have raised heck! Did not even bother to ask... Another barrier to breastfeeding is that men are accusing women of breastfeeding as a tactic for keeping their children from them in divorce/split situations! They are using breastfeeding against them in court! And just because this sounds ridiculous, it may not to a childless judge.